You may experience swelling because of a number of reasons. An injury is usually the main cause of swelling in different parts of the body. The same may happen when you wear something too tight. Whatever the cause, it is important to seek treatment or else your condition may become annoying and painful. You can try different remedies to treat swelling, and many people rely on Epsom salt for swelling. Should you do the same? Can Epsom Salt Work for Swelling? Yes, you can make use of Epsom salt for swelling. It works because it is made of a water-soluble chemical called hydrated magnesium sulfate. The chemical can relax your nervous system as well as muscles. It also helps strengthen your joints and reduce inflammation and swelling. Your body is low in magnesium when you have swelling, and Epsom salt helps replenish those magnesium reserves. This in turn helps your body fight the inflammation. Take two cups of Epsom salt and add it to your bathtub filled with warm water. Let it dissolve in the water before soaking in the tub for about 20 minutes. Do it regularly to help reduce swelling to a considerable extent. Fill your bathtub with warm water. Ensure that it has enough water to cover your ankle. Make sure the water is not too hot or else it may scald the skin. Use warm water only. Add two cups of Epsom salt in the water. Use your hand to mix the salt well. Put your foot into the water only when you have dissolved the salt completely. Soak your affected ankle for about half an hour to reduce swelling and pain. Take a container and fill it with warm water. Use enough water to immerse your hand and fingers completely. Dissolve half cup of Epsom salt in a quart of water. Stir well. Soak your swollen finger in the water for about 10 minutes. Repeat the same several times a day to reduce swelling. You should avoid a soak in hot water if you already have fungal or staph infections. Soaking in hot water with these conditions can make things worse. Be sure to talk to your doctor if your swelling persists even after an hour of soaking. Seek immediate medical attention if your skin becomes irritated or red. Avoid warm soaks if you are a diabetic. Click here for more tips to deal with swelling. Using Epsom salt for swelling is a great idea, but it has many other benefits as well. Here is more about why Epsom salt is beneficial. Not only can you reduce swelling by taking an Epsom salt bath, you can also relax your body in the same way. Your body can absorb the salt through your skin, which can help relieve muscular tension. Epsom salt has magnesium that relieves stress by encouraging the production of serotonin. It also helps reduce the effects of adrenaline. Epsom salt baths really help relieve pain, tension, and cramping, but they also improve nerve function quite efficiently. The benefit comes from the presence of magnesium sulfate which is found plentiful in Epsom salt. It promotes enzymatic functions and maintains a fluid balance in cells. It also helps improve the way your body uses calcium to transmit signals, which in turn greatly boosts your nervous system. Epsom salt has magnesium that improves circulation and lowers your risk of developing cardiovascular disease. It also reduces inflammation and protects the elasticity of arteries. With healthier arteries, you do not have to worry about plaque buildup, blood clots, and damage to arterial walls. Just enjoy an Epsom salt bath 3-4 times a week to enjoy these cardiovascular benefits. The combo of magnesium and sulfate enables your body to produce and utilize insulin more efficiently. By making Epsom salt a part of your diet, you can help regulate your blood sugar and lower your risk of getting diabetes. You will also notice an improvement in your energy levels since your body can now handle insulin better. You can not only use Epsom salt for swelling, you can also consume Epsom salt on a regular basis to help improve digestion and prevent digestive problems, including constipation. It works as a saline laxative and relieves constipation. Take a cup of warm water and dissolve a teaspoon of Epsom salt in it. Drink the water once a day to relieve constipation and improve digestion. You can use Epsom salt to improve the health condition of your skin. Simply take a handful of Epsom salt and rub it directly over your damp skin to get rid of dead skin cells. 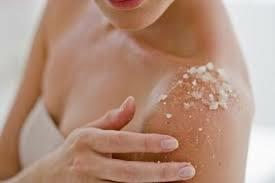 Regular exfoliation of your skin with Epsom salt leaves you with softer, healthier skin. You can make a natural face cleanser by mixing a teaspoon of Epsom salt in your regular cleanser. Just apply it as usual before going to bed at night. You can also use it to make an effective exfoliating facemask. You can rely on Epsom salt to get rid of any buildup of styling product from your hair. Add a cup of lemon juice and a cup of Epsom salt in a gallon of water. Mix well and cover it. Leave it for 24 hours and then pour it on your hair. Wash it off after 20 minutes.